WARPAINT and Unicorns: IMATS TORONTO 2014 new venders, Interesting panel/demos, my wish list, travel advisory & eateries. IMATS TORONTO 2014 new venders, Interesting panel/demos, my wish list, travel advisory & eateries. It's arrive late this year but IMATS is again running on November 22-23 less then 2 weeks away! There also still tickets for both days for the Saturday and Sunday shows for $45. No weekend pass though this time around. Chances are I'll be arrive at 9:30am or 10am on the Saturday just from the way construction is progressing as I'm coming down (well going north ;) ) by Greyhound. 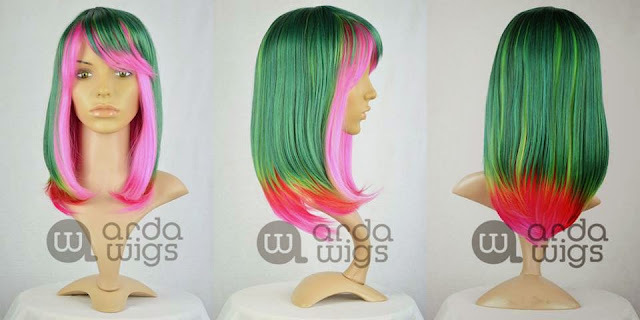 This is Arda's Watermelon wig I picked up and I freaking love it! So I'll be wearing her during IMATS this year. Cozzette makeup is coming this year with the full range of products. I crazy exited that their coming this year and I'm crossing my fingers there bring there interchangeable palettes. Look like they have a full both again of products. They tend to show up every other year so far. More crazy colour lipstick to check out. First time at the show but most people know them for their brush soaps. I'm expecting they are bringing the full line of products. They have eye catching lip shades but also a full range of cosmetics as well. The sites not active, but I'm betting on this being a reseller of Sephora/Shopper Drug Mart type brands. Second year at the show and a another runner for inexpensive brushes. But I'm excited for their new synthetics lines. A Quebec based professional makeup re-seller. They also carry Sigma but given it's their first year I'm not sure what they are bringing to the show. Maqpro, I'm Excited!!!! I hope they have a demo palette. Styli-Style Cosmetics They stopped being a Rexall brand about 3 years ago so It's really nice to see the product again in person. I don't know much about this start up company but there is crazy lipstick shades and glitter I'm checking them out. Learn from a master about kit bashing. I really excited for this one but chances are I'll miss most of it. Carry a little product as possible in your kit and mixing what your need from your staples. Has been the master of tools for years if you never attended on of his panels you should check it out. Jordane Cosmetics is the product used in panel which is a Canadian based FX line you will have seen on TV from Copper, Defiance and The Strain. I'm looking forward to this panel to see what their new line has to offer in the gore department. You must take the time to attend this panel, it will cover his working career and the recent work that was done for Grimm. If you don't catch them on the working stage then here your chance to see them strut there stuff. What ever you can think of to add to a makeup canvas she has done it. I'm going to miss this panel as I want to to a bit of Toronto shopping before some of the shops close at 6pm. The sunday Line up has character panels like The Strain and Reign. If you more interested in this field I recommend attending that day. I'm always sad I don't go on Sundays but I try to budget for travel and ticket prices. Then again this is the ONLY industry makeup focused show in Ontario! I won't be getting everything on my list (I don't need all those brushes) but this is my starting point. Maybe: M536 Milk Tea (Matte), D504 Celestial Beige, ME734 Tangerine (Metallic). Aqua Rouge in 18 Coral. Liptar in Aurora, Jealous, Technopagan, Lament, Manhunter, Hollywood, and Grandma. If you not a native to the GTA (Greater Toronto area) I thought I'd post this for you about what to expect getting the the MTCC (Metro Toronto Convention Centre) South Building again this year. The North and South buildings are attached by a walk bridge. The North building is street level on Front Street west of the CN Tower and goes vertically in levels and well as 2 sub floors. While the South building is behind it and is underground for the most part except the lobby level (500 Level). If you going in by public transit chances are you will be making it to Union Station. Union Station however is going through some serious renovation both street level and inside. Front Street is shut down in front of Union Station (for the drivers), but the building is still functional. For pedestrians/public transit goers inside Union on the street level is attached to the Skywalk which will take you to both the MTCC North and South builds and beyond (Skydome). This is probably your best way to get there to avoid confusion and it tends to be quite. 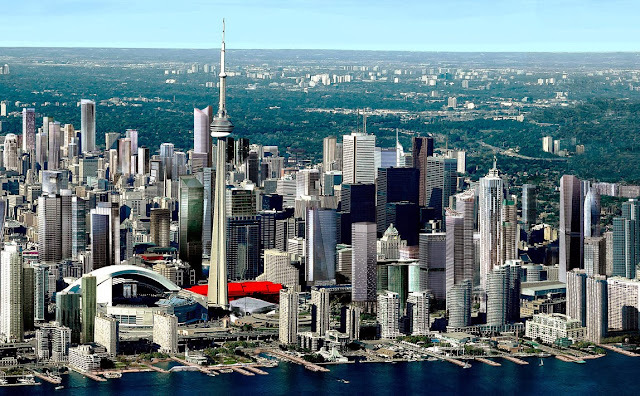 Now places to eat, there are plenty of options around the MTCC as this is consider to the Entertainment district. Front street has many options on the main level but there are places underground like across the MTCC is the Canadian Broadcasting Building sub floor has a full food court. Union Stations also as a full food court on the level below street level for cheaper fare.